START YOUR OWN BUSINESS AND BUILD A FOUNDATION FOR SUCCESS. 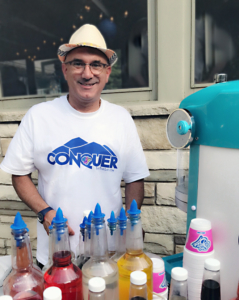 Sno Biz dealers are independent business owners, supported by our regional distribution network. We’ve learned that our most successful dealers start with some business experience – though not always in food or hospitality. They have some capital to invest. They like to set their own schedules and they enjoy realizing their profit potential. APPLY to become a dealer. At the age of 15 I took my first job at SnoBiz in Ridgeland, MS. I enjoyed it so much that seven years later I purchased the store. I had no husband, no kids, and no real debt other than the loan I took out to purchase SnoBiz. That 1st year was the BEST year of my life! I was not really a morning person, so I loved being able to sleep late and work late. I was open from 1-9 Monday thru Saturday and closed on Sunday. My SnoBiz grossed over $70K that year. More than twice what I paid for the business, I was hooked! The flexibility I had was amazing! When I met my husband who had 3 kids and a business of his own we were able to find a balance that really worked well for us, and we didn’t have to worry about losing our jobs if we needed to take off work. The ability to be in control of your future! At age 41, having been in SnoBiz over half of my life, I wouldn’t change a thing. My husband and I are growing our businesses together, taking care of our families, and just enjoying life! I became interested in the Sno Biz product when on a family trip to Jackson, Mississippi back in 2003. There was a line wrapped around the corner of people of all ages waiting to be served something that I had to see. I ordered a rainbow Sno Biz and my tasted buds were satisfied and my entrepreneur spirit was ignited. 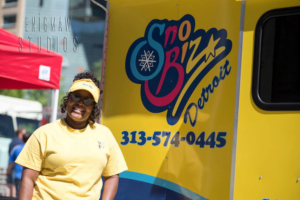 In 2014 Sno Biz Detroit was born. I love being my own boss and serving my community. We have Introduce our product to schools, hospitals, farmer’s markets, festivals, movie productions and the possibilities are endless. We also have two dealers one with a Kiosk and another that is doing private events. We are part of the great transformation of the City of Detroit and the State of Michigan. I am staying with the business because it brings joy to everyone who try’s the product. What better joy is there than to brighten some one’s life with a simple delicious Sno Biz Treat. I joined the SnoBiz family when I was in Beirut, Lebanon in 1999. The assistance I received from Tom and Kris helped me to understand the SnoBiz concept and I was able to take that knowledge to develop Sno Biz in Eastern Canada in 2002. 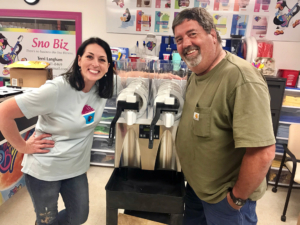 From the help and support from Tom, Kris and Family, along with a strong network of Sno Biz operations worldwide, made me successful year one. I became the “Go-To” contact for Slush within Ice Cream and Coffee shops. People were calling me to do events, and it was easy to grow the brand and it was well accepted. It’s not uncommon to work hard in the summer months and take the winter months off to travel. I cannot find another kind of business where you can work for yourself, without the stress of franchise fees and commitments. I am forever grateful for this brand and the SnoBiz Family. Oftentimes, when I talk about SnoBiz, people ask me if I have shares in the company, that’s how proud I am! After the years of doing events, I have come to realize that you do not need a big space to make big money- with excellent profit margins! – Paul Hobeika, Sno Biz of Eastern Canada.